At Proforma YoungCo, we know that a good looking website can help create the right impression for your company. But your site should do more than just look good. We create websites that help turn prospects into customers and customers into raving, evangelical fans; and we do it all with your bottom line in mind. Website Design - Responsive website design so your site looks good no matter what device you view it on. Website Development - When we create a site, we dive deep into what the end-user would want to see on the site. What would make the site useful and meaningful to your client? That's what we deliver. Hosting - Hosting services complete with domain based email and SSL certificates to keep your data secure. Support & Training - Support packages to make sure your site is always up-to-date and running the latest version. 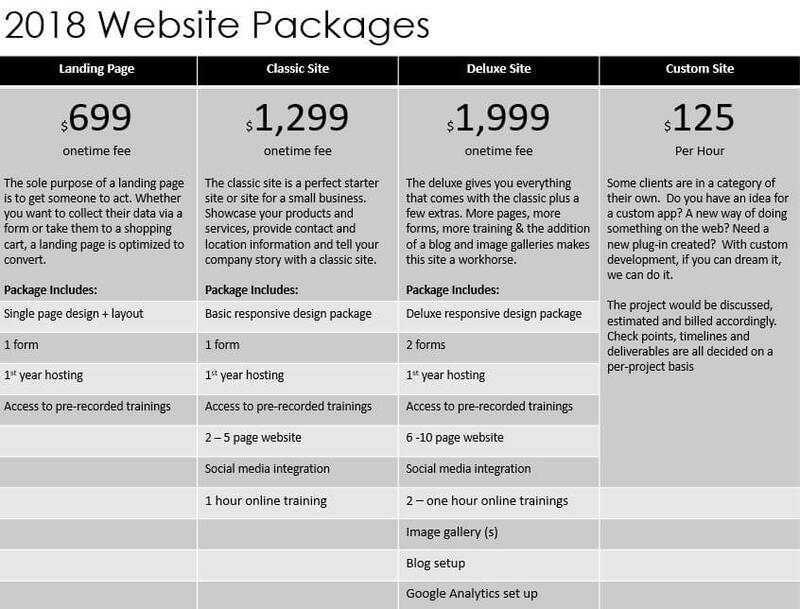 If you'd like to be the one making your website updates, we'll train you how to do it. Search Engine Optimization - Search engine optimization packages to make sure that your website is easy to find in the search engines. Email Marketing - Own the relationship with your client and send targeted, relevant information on your schedule. We'll help you get up and running with effective email marketing campaigns. In an attempt to answer the age old question of "what does a website cost? ", we have created the following packages as a starting point for many of our clients. We know that these packages won't fit every client's needs, however, it does give you an idea of what kind of pricing and services you will get from Proforma. To learn more about how Proforma can help you promote your business, contact us today for a complimentary web analysis.